I’m actually banned from using Google unless I accept their terms. I still don’t fancy this so it has given me an incentive to try out other search providers and – guess what – I get along fine. Great. 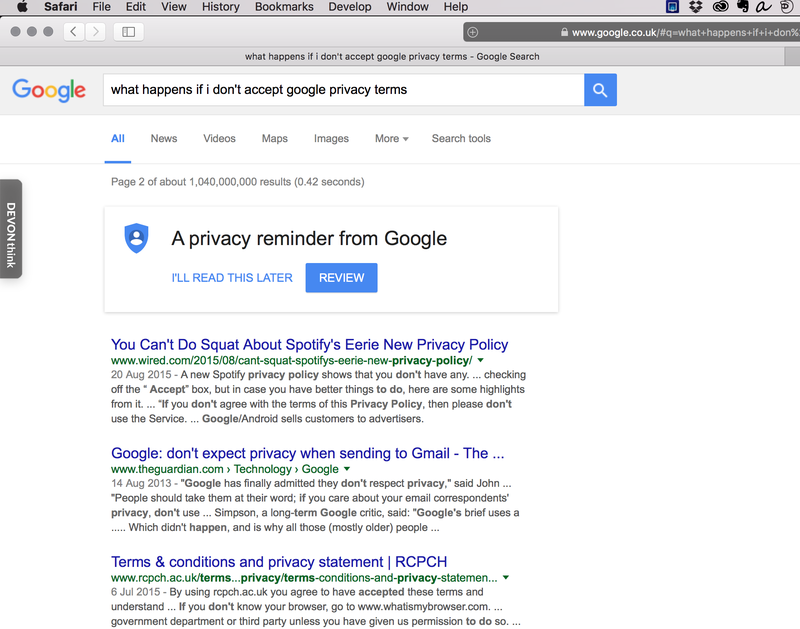 So… I can work around that if I try – “incognito” browser window (I get the “privacy reminder” message, still, but I’m not blocked), different computer, etc. But it’s annoying. Really strange. My browser can’t connect to Google sites at all. Now perhaps this was some weird technical thing – but the internet was working fine for other sites (you can see that the second one is a YouTube video embedded in a Bing search result) and I didn’t get the same error in other browsers. So I can’t help wondering if Google’s servers are now refusing to talk to me at all. Sent my computer to Coventry. Pretending not to be there. Whether or not that’s what happened it makes me think about the whole issue of permission, Google’s insistence that users must explcitly agree to give them data as a condition of being able to use their service brings the whole issue of “free” into clear sight. None of this is a criticism of Google. I think this is rather great, actually. I like that the deal is being made clear – at least to people who aren’t logged into Google, and that they can make their own choice about whether to click the “accept” button. But it does highlight the issue. Permission matters – and not just in copyright. It highlights another issue too which I alluded to above. It’s all very well asking me to opt in as a condition of using Google’s services, and all very well for me to decide not to and live without them if I want. But what about when I’m NOT using Google’s services? I’m using someone else’s and it just so happens that THEY have decided to use Google to help? Look at this email I got today from a company called Brewbot who make a cool device I will probably never own which brews beer for lazy people like me. So Brewbot, it turns out, seem to have been unwittingly recruited as a data gatherer for Google. Before I can offer my survey results to Brewbot I have to agree to silently give Google the long list of stuff I described above. Or, to look at it another way, companies using Google to host their surveys, documents, videos, whatever, are actually only able to offer those things to opted-in Google users. Not to everyone. As long as Google remains ubiquitous perhaps the distinction isn’t obvious, but who is aware of it? This seems dysfunctional to me, and unfair. It seems a high price to pay, for users and for companies who are using Google’s services (and may well be paying for them) for reasons that are nothing to do with Google’s core consumer services. At its heart it highlights the conundrum which is central to so many of the issues which copyright people – as well as the internet at large – need to sort out. This silent, unknowing, pervasive process which takes the place of permission and transparency is not, in the end, serving the broad interests of the users of the internet. I’m unusual in not having accepted Google’s terms, which means I am also unusual in seeing these messages which make what’s going on slightly more explicit to me. But isn’t this an interesting perspective from which to consider the question of price and value on the internet. While money often doesn’t change hands, rendering lots of internet services nominally “free”, lots of other valuable stuff is still given in return – and if it’s not, the service is withdrawn. At the heart of it all, value is being exchanged for permission. The same thing that happens in the copyright world. It needs to be done better. End users are the focus of everyone in the creative industries. But they’re strangely neglected. It’s time to think of them as active, not passive, customers. End users are strange beasts, in the copyright world. They’re the ultimate goal of all creative endeavours… what’s the point of creating something nobody wants to see? But in terms of their interaction with the actual nuts-and-bolts of how copyright works they’re treated almost as an afterthought. They’re the passive recipients of content and they are expected to stay passive. So while the business of passing copyright around, licensing and trading, is a very active, involved and evolved one for everyone else in the chain – the creators, the publishers, the distributors and others – it’s curiously ossified for End Users. “Not to be shown on oil rigs”, the warning sternly says at the start of a DVD. That’s a licence, of sorts, but not one you get much say in. “Not to be stored in a retrieval system” say books before you get to the actual story. You’re not allowed to do anything other than what they say, you’re positively discouraged from doing so. I have no idea what is involved in legally showing a DVD on an oil rig, and the warning notice doesn’t explain, but I’m sure it’s not simple and not cheap. There are good reasons for this. Principal among them the fact that in the past end users only wanted to consume things. They were naturally passive creatures in a disconnected world. Which is good, because managing the complexity of everyone needing a slightly different licence was way too expensive for the mass market. It all came together in what management consultants would call a virtuous circle, passive consumption leading to a mass market for cheap products, leading to a huge diversity of products and generally falling prices. But it has changed now. End users are no longer passive. They do things other than just sit and stare. They tweet, they blog, they email, they chat, they link, they post, they comment, they mash-up. They include the content they consume in the output of their online life. They – we – are not End Users any more. We’re End Re-users. As far as I know, the term “End Re-user” was coined in the News Corporation submission to the Hargreaves Review of Intellectual Property in the UK (I had a hand in drafting this submission). I think it’s a useful concept, because it encapsulates both the challenge and the opportunity for the future. The challenge is the obvious one. If users want to do all sorts of “use” of content, they’re no longer passive and they’re straying outside the boundaries of the licences they have been given. That makes them infringers. And that fact alone gives rise to a range of proposals from legislators, anti-copyright activists and an assortment of thinly disguised vested interests to change the law. It can’t, many say, be a good law if it throws so many people into breach of it. Considering this from the point of view of the law is the wrong perspective, though. The law gives end users virtually no rights at all. The thing which allows a user to do something with a piece of content is the licence from the content owner, not the law. The problem isn’t with the law, it’s with the paperwork. Which leads to the opportunity. Very few businesses have become really successful by refusing to give their customers what they want. This emergent generation of End Re-users should represent a huge new business goldmine. All these people who want to user material in different ways are potentially more valuable customers. Every time they want to do something beyond just sit and consume, they’re creating value. They might not be worth much individually, but there are millions of them out there. And as long as you can collect it simply, even a few pence can be profitable. Just ask The Sun. The practical barrier to treating them as an opportunity, the complexity of managing all those licences and payments, ought to be eliminated by technology. Some people argue that technology, because it drives the cost of copying content to zero, will inevitably lead to content being valued at zero. I would make a different argument. In freeing ourselves from the limitations of the physical supply chain for creative products we have also freed ourselves from the mass market constraint that every customer has to want, and get, the same thing. The real liberation of the move from atoms to bits isn’t the end of cost and price, but the end of the need for one size – and one price – to fit all. It ought to be feasible to cater for the blogger, the passive consumer and the large scale commercial publisher individually and cheaply. The advent of the zero-cost copy frees the creative industries, and their customers. from the straitjacket of mass production. Technology creates the opportunity for fabulous growth and innovation, with everyone’s needs met by the right content and a fair price for them. All of which sounds wonderful, but it doesn’t bear much resemblance to the real world of the internet today. If this huge opportunity is lurking in the shadows, why hasn’t it come out into the open yet? Surprisingly, the answer is only partly that the technology doesn’t yet exist. Most of it does, and what’s left really needs a market to evolve around, at which point it will begin a symbiotic flourishing along with the market. Perhaps the same could be said of many of the existing media businesses. Incumbent players are rarely the best innovators – they need to be shown the way forward, usually by younger, nimbler competitors snapping at their heels. But those new entrants don’t really exist, leaving the existing media companies and their still substantial existing businesses with the classic innovators’ dilemma. The absence of these new entrants is another signal that all is not as it should be. So evolution online, when it comes to content businesses, has moved at a glacial pace in the last ten years. New entrants restrict themselves, by and large, to gaming the advertising market with low content costs and clever search optimisation. Older players, with their high investment in content, struggle to find success to match their huge online audiences. In my view the enemies of change in this area are the vested interests of the dominant players on the internet and to some extent the law. Many companies which make fortunes from the internet depend on the chaotic and un-evolved market of today remaining. What is needed is technology to manage billions of complex licences, at low cost, on behalf of millions of creators and hundreds of millions of consumers. The potential of technology to manage these relationships remains unfulfilled not least because it would damage the business of Google (whose aggressive lobbying against the Automated Content Access Protocol betrays their real fears in this area). And without Google’s support, or at least compliance, anything which affects the web broadly has little chance of getting established. Anyone making billions of dollars a year from the ability to treat the whole internet as a free resource understandably wants to maintain the status quo. As the ultimate re-user they would have lots to lose, and at first glance little to gain, in a world where their use, along with everyone else’s, could be properly licenced. The law, in the form of various internet–friendly statutes enacted to protect the then nascent ISPs and search engines, to a great extent enshrines and protects this status quo. So it shares the blame. While copyright law may remain largely intact, the law creates perverse incentives which, my providing immunity for ISP and service providers, effectively protect the interests of infringers. As long as the law makes infringing use of content free and virtually risk-free, it will be hard for competitive new markets to emerge. So the law preserves and protects the new status quo. But the status quo, while serving a narrow range of limited interests well, serves everyone else badly. End Re-users, the obvious big opportunity online, are un-served by antiquated processes and approaches to licensing. A range of entrepreneurs who would like to be able to use content more easily in their businesses, find it difficult and frustrating to do so. And content owners are wilting in the harsh reality of a digital environment in which audiences generate pitiful returns. So I think we should all keep the End Re-user in mind when we consider the online landscape. Their interests are paramount not just to them, because they want to be able to do what they want with the content they like, but to everyone in the digital ecosystem because well-served end-users will be the generators and beneficiaries of much of the unfulfilled potential of the internet.